Flexible, lightweight, and versatile CNTs are becoming a valuable material in conductor applications for the military and a host of other markets. Carbon nanotubes are one of the most unique and interesting materials developed in the last decade. These products, widely known as CNTs, can be manufactured by various methods, but are most commonly made using chemical vapor deposition, a high-temperature manufacturing process used to create durable, solid, high-performance materials. The end result is a paper-like, ultra-thin sheet that can be further processed into a variety of forms suitable for a wide range of applications. This material can become an electrically charged carbon sheet with some very special properties that are of great utility in conductor development. CNT sheets can be spun into fiber-like strands and twisted into various configurations that simulate copper stranding. An insulated jacket is then extruded on top of the carbon nanotube to create a wire. The resulting product is approximately one-eighth the weight of a typical copper conductor wire and has a strength-to-weight ratio 117 times that of steel. Additionally, because the material is fundamentally a type of plastic, it does not have the same fatigue characteristics as copper wire. CNT technology can also be used to replace copper shields. 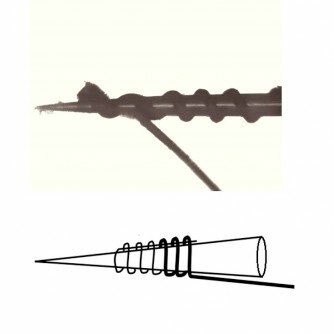 By simply taking a thin CNT sheet and wrapping it around the wires to form a shield (see Figure 1), designers can achieve substantial weight savings over copper shields. CNT technology has had limited viability for use in many aerospace applications due to its higher initial costs. However, costs are coming down quickly. In the early development years of CNTs, the material cost around 500 times as much as copper. Today, the cost is closer to 10 times that of copper and, within the next five years, CNT is expected to command only a 20–30% price premium. The electrical conductivity of CNT technology is vital to its overall success in electrical interconnect applications. In the early research and development phase, the resistivity of electrically charged CNTs was about 200 times that of copper. More recently, that value dropped down to only 20 times that of copper. Now samples from manufacturers are getting closer to 10 times the resistivity of copper. The current objective for leading developers of this technology is to bring it down to five times that of copper. If that happens, it will be a real game-changer. Lightweight shielding is very important to the defense industry, and CNTs show great promise here. Currently, CNT shields exhibit performance similar to copper at frequencies above 1GHz, but performance drops off significantly, especially at frequencies below 100Mhz. The weight savings over copper can be as much as 80%, though, so there is a trade-off that largely depends on an application’s EMI requirements. Solutions include using a combination of a CNT shield with a smaller-gauge copper shield, which could still reduce weight and perform reasonably well. Initial research into using CNTs to advance connector technology has focused on two primary areas: coaxial cables with RF connectors and mil standard 1553 data bus cables with dedicated discrete connectors. There are also efforts to evaluate CNTs with standard 38999 Series III connectors, as well as with miniature push-pull circular connectors commonly used in soldier systems. With the exception of the RF connectors, the preliminary results are encouraging, and show viability. However, this application may require some minor modifications to either the contacts or to the inserts. More research is still needed. The development of carbon nanotubes is truly a global effort led by several universities, including Rice University in Houston, that collaborate with CNT producers. Over the last few years, manufacturers in the US, Japan, and other countries have significantly scaled up production to help reduce costs to the point at which CNTs can become a viable multi-use product. These suppliers of CNT yarns and sheets are also working closely with several wire manufacturers to produce primary wire, cables, and RF coaxial cables. One immediate application being evaluated by the defense industry is the replacement of copper-based 1553 database cables with CNT conductors and shields. The weight savings they offer can be upwards of several pounds, which is an especially significant advantage for space applications, as each pound of payload typically costs upwards of $10,000 to launch into space. Electrical testing has already been conducted to determine the signal integrity loss of CNT conductors and shields and has returned surprisingly good results, showing little signal loss degradation on lengths up to 10–15 feet, which will only improve as the conductivity of CNT materials continues to improve. In addition to the space market, two helicopter manufacturers in the United States are conducting independent test studies to determine the viability of CNT materials for use in the rotary wing market. CNT’s unique set of properties is helping the material find a place in applications across nearly every industry. CNTs are currently being employed in and evaluated for applications including optical power detectors, radar absorption, microelectronics, transistors, thermal management, solar panels, and even body armor. 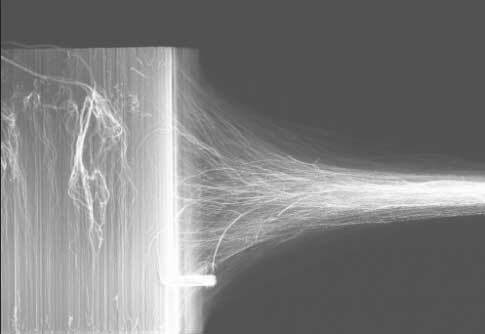 With this versatility, the future looks extremely bright for carbon-nanotube-based products. until 2070. (For comparison, the cost per pound for the F-22 is estimated at $3,500.) The F-35 has projected production of2,557 aircraft for the U.S. and nine for export customers scheduled through 2037. Therefore, a weight reduction of just 20lbs per plane could result in savings of $230,000,000! Even if this is off by 50%, the expected benefits already are driving new industry developments. Carlisle Interconnect Technologies (formerly Micro-Coax Inc.) provides a unique weight-reducing EMI/RFI shielding solution using their proprietary high-strength ARACON® brand metal clad fibers. Ron Souders, technical director, Carlisle Interconnect Technologies, advises that, for typical applications, switching to ARACON allows a weight savings of 80% when compared to traditional metal braided or woven EMI shielding products. This offers the conductivity of an outer metal coating with the strength, light weight, and flexibility of aramid fiber. 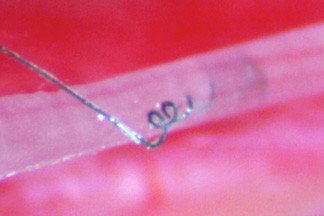 *Note: DexMat also provides products for shielding applications not mentioned in this article.